Auroville is an “experimental” township in Viluppuram district in the state of Tamil Nadu, India, near Puducherry in South India. It was founded in 1968 by Mirra Alfassa and designed by architect Roger Anger. Source Wikipedia. Auroville wants to be a universal town where men and women of all countries are able to live in peace and progressive harmony above all creeds, all politics and all nationalities. The purpose of Auroville is to realise human unity. Auroville belongs to humanity as a whole. But to live in Auroville, one must be a willing servitor of the Divine Consciousness. of constant progress, and a youth that never ages. Auroville will be a site of material and spiritual researches for a living embodiment of an actual Human Unity. There is a famous ‘meditation hall’ (it’s not a hall, it’s very difficult to describe ….). 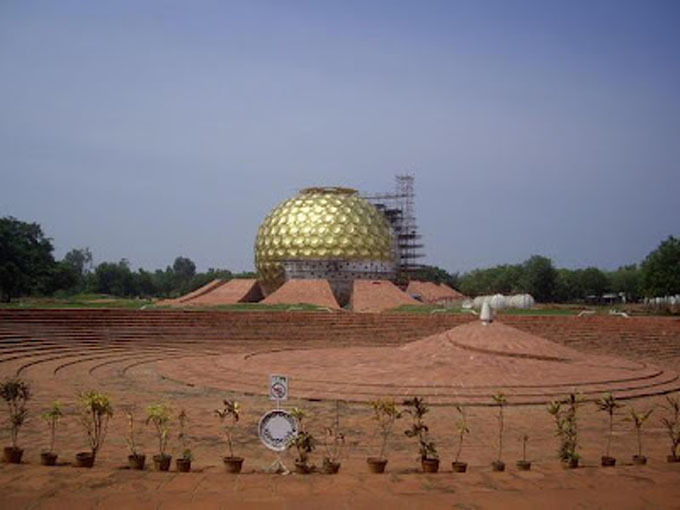 The Matrimandir (image below) is a shrine of the Universal Mother and the Soul of Auroville; it is meant for those who, in the Mother’s words, are sincere and serious and truly want to learn to concentrate. The Matrimandir is not a temple in the conventional sense of the word; it is neither a place of worship, nor to be associated with any religion, whether ancient, present, new or future. It is place of concentration. Matrimandir – the inside is simply amazing, a ‘one of a life time experience’.